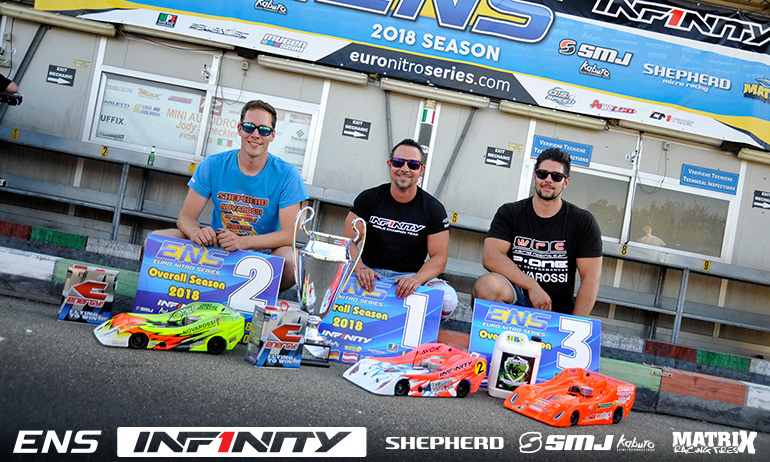 Dario Balestri is the 2018 Euro Nitro Series Champion, the Infinity driver lifting the title with victory ahead of team-mate Carmine Raiola at the season finale in Fiorano, Italy. 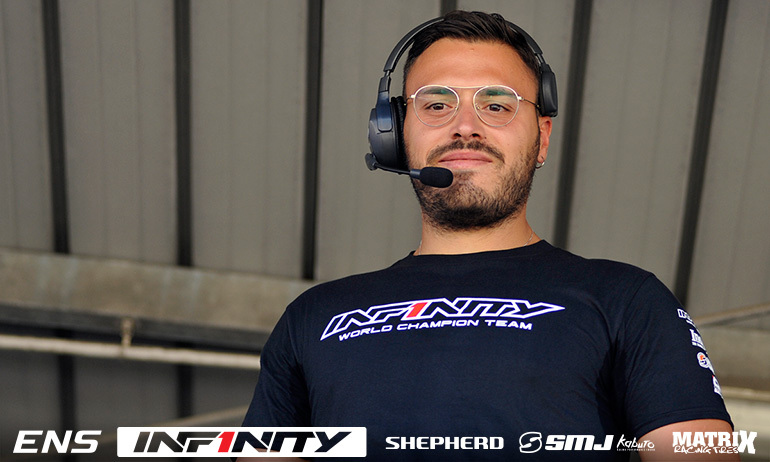 The World Champion came into the weekend as one of three drivers in contention for the title but with reigning champion Simon Kurzbuch taking the TQ bonus point that eliminated Toni Gruber from the battle. 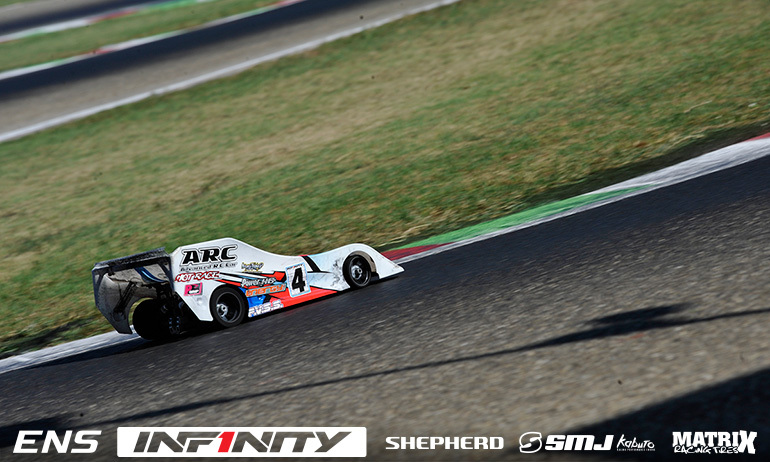 With Balestri qualifying P2, the final would be a straight up battle at the front for the race win and the title. 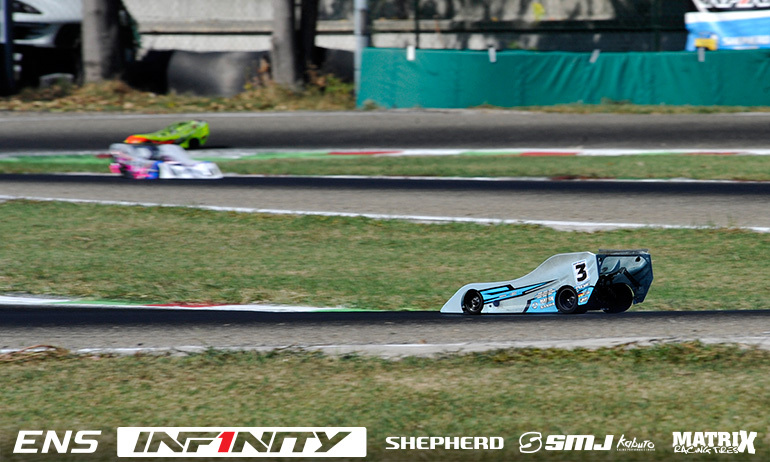 Pitting together Balestri would find a way passed Kurzbuch after the second round of fuel stops with a pass on the out lap and then began to gap his rival. Unfortunately for the Shepherd driver, his race was to go downhill, a sticking one-way bearing causing an off that would end his quest for a hat trick of titles. 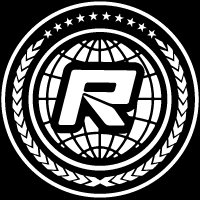 The worsening problem delaying him further later in the race and leading to his retirement just inside the final 10-minutes. With his rival in trouble Balestri took charge of the 45-minute race with the attention now on the battle for who would join him on the podium. Riola, Andrea Pirani and 3rd place qualifier Robert Pietsch all took part but there was cruel luck for Pietsch as he battled with Riola over second. Entering the pits together for their final stop, Pietsch led them out of the pits but at the other end of the pits Alberto Picco’s car was released and collected by Pietsch’s Mugen which from the opposite end of the pit was already running in 2nd gear. 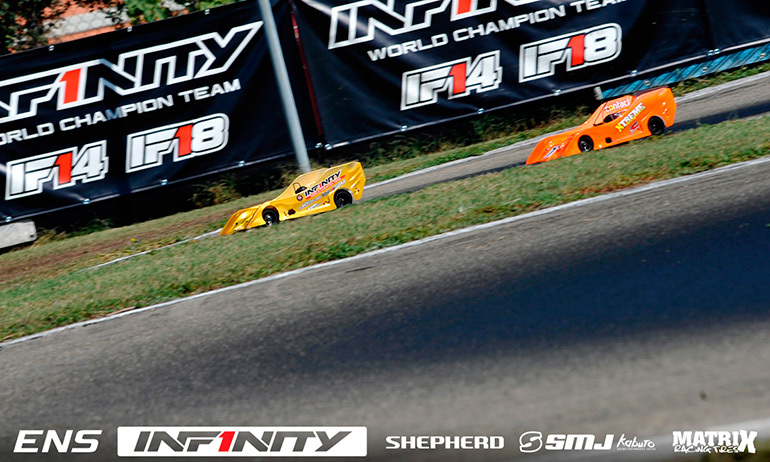 The impact destroyed Pietsch’s car ending his race on the spot, allowing Riola in to second for an Infinity 1-2 while Pirani inherited his second ever ENS podium finish. ‘We won’, said a very pleased looking Balestri, continuing, ‘honestly when Simon had some problems I just try to go to the end’. Formerly the champion in 2015, that title also decided at the final round between himself and Kurzbuch, he added, ‘When I followed him at the start I felt I had more speed. The car felt really good. Then my pitman gave me some tenths in the pitlane and I was able to make a pass on the out lap. I really need to thank Massimo (Mannucci) for this. Of course I have to also thank Kenji for everything and Massimo (Fantini) for the best engines. Today we won the race and the championship so we can all be very happy’. Pleased to end the championship with his first podium finish of the season, Raiola was also slightly frustrated he hadn’t been able to start the race higher up on the grid. The newly crowned Italian National Champion said, ‘everything in the race was ok but we start too much behind and lost too much time in the beginning. I need to start 2nd or 3rd not 5th to fight for the win’. He added, ‘It is a good finish to the season for me and I am happy with Dario’. A very happy Pirani said, ‘I think this is my best ENS result. Everything went the right way and I made a very clean race’. The ARC driver added, ‘we decided to fuel before the others so as to avoid others in the pit and also to be sure not to have a flame out’. He continued, ‘In the end I was lucky. I was fourth then Pietsch crashed and I ended up in third. For the last race of the season it is a nice way to end the year’. 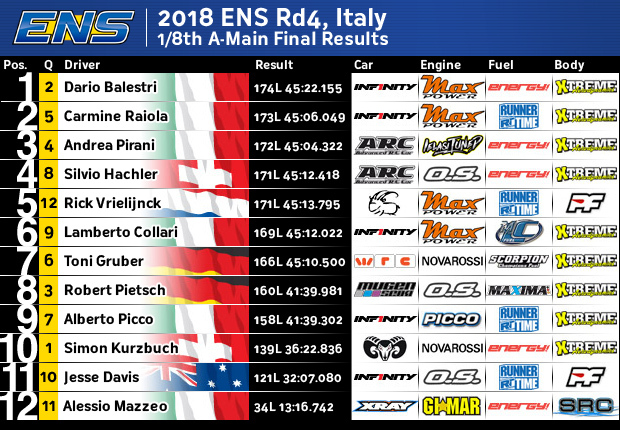 Behind Pirani, Silvio Hächler finished 4th just ahead of Rick Vrielijnck who started last on the 12-car grid having bumped up with Alessio Mazzeo from the B-Main. 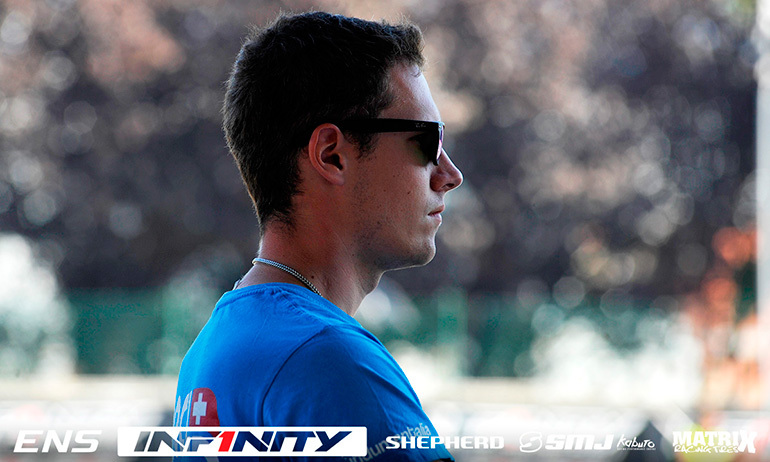 Commenting on his retirement from the race Kurzbuch said, ‘the result was super bad for us. Everything was going quite good but then the one way in the gearbox locked up and I went on the grass at the end of the straight. I tried to push what I can but it locked again and then it completely locked near the end and the race was done’. The ENS’s most decorated driver he went on ,’this ENS Season has been really bad. The speed was good in qualifying but we need to work on reliability in the finals’. ‘I don’t have words’ was Pietsch reaction to his ungraceful exit from the race. He said, ‘Edo put out Alberto’s car without checking and because he was at the other end of the pitlane to me I hit him in second gear and it destroyed the car’. On his race prior to the crash, the Mugen designer said, ‘I had a small mistake at the beginning which lost me 2-seconds but then in the first stop I damaged the bumper and when the tyres started to get smaller I started to lose steering. Running one less stop than his rivals and taking the lead in the early part of the race each time they did their stops, he concluded, ‘Otherwise I feel I could have challenged Simon and Dario today’. In the 40+ Final, we got only the second different winner of the inaugural season for the new class in Andrea Hächler. Chasing a clean sweep of the championship, Champion & Top Qualifier Arie Manten was pulling clear until he hit a lapped car after just 5 laps which dropped him to the back of the field. Second placed qualifier Bo Nielsen then took up the lead but just as the race reached 2/3rd distance he hit the pitwall, his race ending immediately. This moved Hächler, father of Silvio, into a lead he would hold to the finish. Finishing on the same lap Rudi Scherer took second with Manten recovering to complete the podium.